Goose VPN review 2019 | Does it log your activity? How fast is it? GOOSE VPN offers a secure and reliable service through its easy-to-use apps. It unblocks Netflix and other streaming sites and can be used for torrenting. There’s no protection against DNS and IPv6 leaks, and customer support could be better. 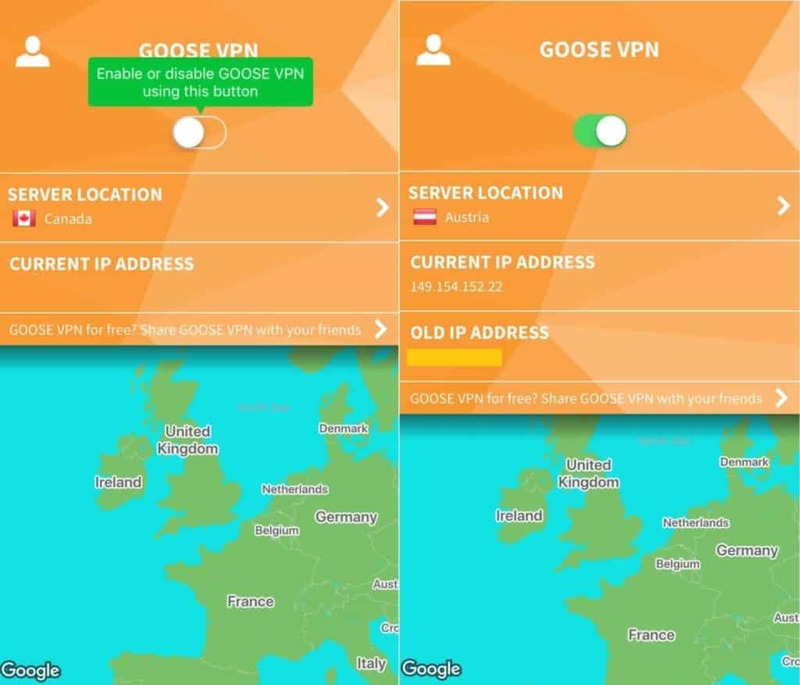 Netherlands-based GOOSE VPN is a relative newcomer to the VPN scene having launched in 2014. This provider pegs itself as “An accessible VPN provider who really listens to its customers.” It claims to guarantee your safety while using the internet through a secure and user-friendly service. We took this VPN for a test drive to see how it performs compared to the competition. 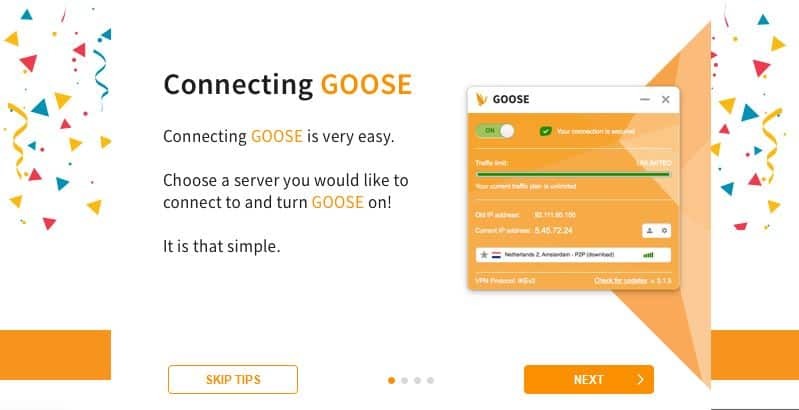 GOOSE VPN offers two different packages, one with a 50GB data cap and another with unlimited data. They can both be purchased on a monthly basis, but the Unlimited plan is also available on an annual basis at a reduced rate. The 50GB package will set you back $2.99 per month. It allows for an unlimited number of simultaneous connections, although 50GB may not get you too far if you have multiple users. The Unlimited plan has no data cap and also allows for an unlimited number of simultaneous connections. You’d have to wonder how this is sustainable as you could just have someone sharing their credentials with multiple users, perhaps even for a fee. It’s likely that accounts are monitored for abuse of the system, but even so, we’d guess that there may be a cap on simultaneous connections at some point down the road. Most offer around five which is usually ample for an individual user. This plan will cost you $12.99 per month, which is pretty much average these days when compared to other providers. Earn a 62 percent discount when you opt for an annual plan, and at $4.99 per month, this is, again, about average as compared to competitors. Although, some companies offer two or three-year terms with steeper discounts, so you can find monthly rates under $3, even for top providers. 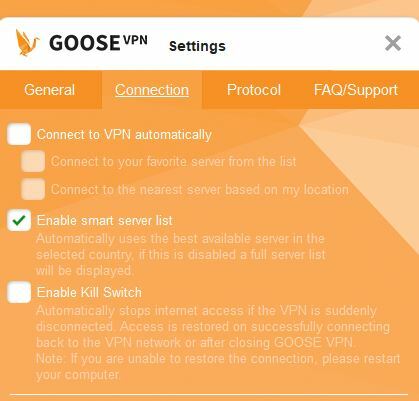 GOOSE VPN offers one addon option to all of its plans. You can pay an additional $1 per month (or $0.83 per month with the annual plan) to add anti-virus, anti-malware, anti-phishing, and extra firewall protection. According to a customer service representative, “the extra security is an extra check on our side of the connection.” It is still recommended that users employ an additional antivirus software. If you’re signed up to GOOSE VPN and are enjoying the service, there is a way to get a kickback. The referral program gives you $10 each time you refer a friend. Plus, your buddy gets 30 percent off their plan, so everyone wins. One excellent perk with GOOSE VPN is that the first month is free for all plans. You do have to have to hand over payment information to qualify, but you won’t be charged until the first month is up. You can opt to cancel any time during that first month. This is a step up from a 30-day money-back guarantee where you do actually pay for the first month if you continue to use the service. We’ve seen other providers offer similar free trials, for two, three, seven, or even 14 days, but a full free month is pretty rare. 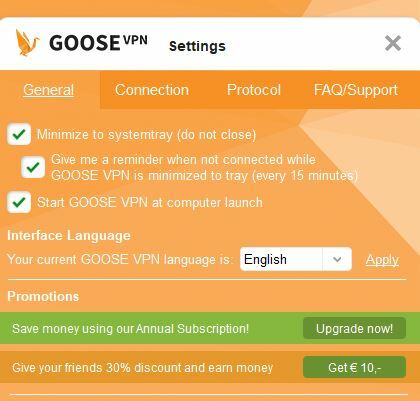 To pay for GOOSE VPN, you have several options: PayPal, a major credit card, Giropay or iDEAL. There aren’t as many alternatives as you’ll find with other providers. Notably missing is the option to pay with bitcoin, directly or through a coin payment platform. This may be a turnoff for more privacy-conscious users. Apps are available for Windows, MacOS, Android, and iOS. 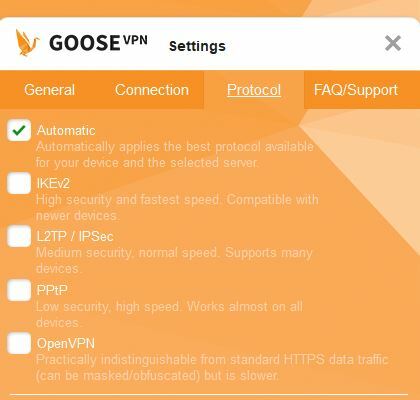 GOOSE VPN can be manually configured for Linux and some routers. However you connect, you’ll have access to a network of almost 100 servers concentrated mainly in Europe, with a dozen or so in North America and several in Asia and Australia. Security and privacy highlights include strong encryption and a built-in kill switch. The latter will kill the internet connection automatically in case the VPN connection is dropped for some reason. This acts as a backup to prevent your activity being inadvertently exposed. The kill switch is currently available for Windows and MacOS, but not iOS or Android. Once you’re signed up with GOOSE VPN, the setup process is straightforward. For the purposes of this review, we used the apps for Windows and iOS. Once you’ve downloaded and installed the app, the first time you access the client, you’ll be greeted with a series of starter tips. These cover the basics such as connecting to a different server and using the app to stream content. Once that’s out of the way, you’re left with a simple and somewhat dated main screen. This is a far cry from some of the sleek modern designs we’re used to seeing. The haphazard design makes it a little less intuitive than other VPN clients but you’ll likely get used to it quickly. You can close the client at any time but it will continue to run in the system tray. The server selection dropdown is in the middle of the screen just below your current IP address. You’ll notice some servers are labeled with a P2P or video symbol. These servers are optimized for P2P or streaming respectively. You can make any server your favorite by clicking the star to the left of the location. While some clients enable you to create a favorites list, in this case, only one server can be selected as a favorite at a given time. Once you’ve selected the server you want, you can use the ON/OFF toggle towards the upper left-hand corner of the screen to connect. When you’re connected, you’ll see your old IP address is still displayed, but your new VPN IP address appears just below it. The other major point of note in this screen is the settings button, to the far right of your IP address. Clicking this will lead you to a new screen within the client with four tabs. The General tab has a couple of options for the general behavior of the app. If you tend to stay disconnected for periods of time, we recommend turning off the 15 minute reminder as this can get pretty annoying. The other option here is to change your language from English to German or Dutch. In the Connection tab, you can opt to enable the VPN to connect automatically on startup, either to a favorite server or to the one nearest to your location. Bear in mind this is disabled by default. Below that, you can choose whether you want to use the “smart server list.” When this is enabled (which it is by default), your main screen server list will be limited to the best servers for each country. Conversely, disabling this option will show the full list. The final option in the Connection tab is to enable the kill switch. This is disabled by default, so if you’re particularly security-focused, this may be one of the first settings you change. The Protocol tab, as expected, is where you can change your protocol. It’s worth noting that the options here come with brief explanations, which is really handy, especially for beginners. In fact, we see a similar pattern in all of the settings screens. This is a nice touch as is negates the need to constantly go back through documentation if you’re not quite sure what something means. As for the protocol, you can make a choice or simply set the client to automatically select the best protocol for your device and selected server. The final tab here is the FAQ/Support screen where you’ll find a link to the FAQ section and the option to send a support ticket. Note that clicking Send will automatically debug and open a ticket. You’ll be led to a browser screen where you can enter additional details. Overall, although the aesthetic is a little dated, this client is intuitive and the settings explanations add a nice touch, especially for beginners. The mobile app has a more modern aesthetic than its desktop counterpart and is well-designed and intuitive. In case you need extra guidance, once you’re logged in, you’ll see a series of messages explaining the app. The main screen consists of a server dropdown menu and your current IP address. Once the VPN is connected, your new VPN IP address will be displayed too. To access the app settings, you can select the account (person) icon in the upper left-hand corner, then choose ADVANCED. In the resulting screen, you have a few options including whether to keep the VPN on all the time, which protocol to use, and whether or not to automatically use the best server for your location. That’s about it from the iOS app. It serves its purposes but has a limited set of options, so some users might miss additional features. GOOSE VPN’s small network comprises around 90 servers, more than 70 of which are in Europe. There are just over a dozen US servers to choose from as well as three in Canada. The remaining few are in Asia and Australia. While many users will be happy with the Europe and North America selections, those looking to access content from other parts of the globe might need to look elsewhere. 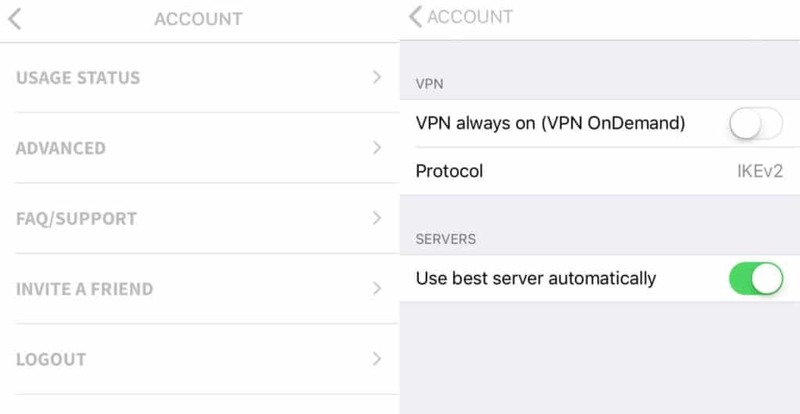 As mentioned, you can use the smart server option so that the app chooses the best VPN for each country. Alternatively, you can base your selection on your use case, such as P2P or streaming. You can also add a favorite server and adjust settings so that you are automatically connected to this server on startup. Although the network is relatively small, the performance we experienced was solid. Switching between servers was simple and never took more than about ten seconds, which is great. We played online games while connected to various test servers and experienced no issues. We used the same servers to stream 1080p video with no buffering. With our speed tests, we try to be as empirical as we possibly can. Using a test server in Canada, we download a 50MB file from a server in the US. We do this while connected to test VPN servers in the US, UK, Hong Kong, Australia, and Germany. We run the test for each location fours times per day, every six hours. The average download speed for each test is recorded and the aggregate data displayed. The Simple tab in the chart below shows how GOOSE VPN compares to other VPN services we’ve tested purely on the basis of median download speed. As you can see, it’s on the faster side of our test set with just a few competitors having faster median speeds. In the Detailed tab, you can see a more insightful version of our results. This shows that GOOSE VPN indeed pegs some excellent speeds, which is a pleasant surprise for such a small provider. In addition, the spread in the results we have so far is quite small, indicating that it’s fairly reliable in terms of speed. We should note that these tests aren’t absolutely definitive and only provide an indication of the performance you can expect. The inherent volatility of the internet inevitably adds a significant factor of randomness. In addition, you might see much longer wait times with a slower connection, and discrepancies could be smaller or larger. Does GOOSE VPN unblock Netflix? We tested access to US Netflix by selecting the USA, Streaming server option with the smart server list enabled. We were able to stream shows with no issues. Out of curiosity we attempted to access US Netflix through the regular US server option and couldn’t even access the website. We seamlessly unblocked Netflix UK using the UK, Streaming server selection. With dedicated streaming options, it’s clear that this provider is focused on ensuring users have access to popular sites. Netflix has been cracking down on VPN use to access its libraries by blocking traffic from known VPN IP addresses. Many providers have struggled to circumvent these blocks, some giving up altogether and focusing on other areas instead. As such, it’s great to see simple access to Netflix without even the need to contact customer support. Aside from Netflix we tested Amazon Prime, which worked with UK servers but not US. We were able to access BBC iPlayer though a UK server. Does GOOSE VPN work in China? We got a mixed response on this but it looks like you’re out of luck if you want to use GOOSE VPN in China. A live chat agent told us it would work fine but an in-house rep later told us that the service has been blocked. Instead, GOOSE VPN is focusing on enabling user access in UAE and Egypt where firewalls are also hampering attempts to use VPN. GOOSE VPN is located in the Netherlands, a 14 Eyes country that is subject to potential mass government surveillance. However, this provider maintains a strict no logs policy and doesn’t track any user activity whatsoever. Connection logs include a date stamp and operating system used, but IP addresses are not recorded. So even if GOOSE VPN was forced to hand over records, there would be no personally identifiable information available. What’s more, all connection logs are deleted after 30 days. For security, this provider uses 256-bit AES encryption, which is considered as good as it gets. This is in conjunction with 2,048 RSA keys for authentication along with perfect forward secrecy. You have a variety of protocol options depending on your needs, including OpenVPN, IKEv2, L2TP/IPSec, and PPTP. Unfortunately, IPv6 and DNS leak protection do not come built into the GOOSE VPN app. These leaks can pose a risk to your privacy and many VPN providers offer protection against them as standard. However, we did test GOOSE VPN for DNS leaks while connected to various servers and found no issues. We’re told that in-built protection will be added in the near future. A kill switch functions as a backup by killing the internet connection if the VPN connection happens to drop. This is available in the Windows and MacOS clients, but not in the mobile apps. If you need some help getting set up or troubleshooting issues, you have several options. The FAQ section is well-organized and answers general questions, as well as those related to payment, privacy, and setup. If you have a more specific issue, there is a 24/7/365 live chat option. We had mixed results with the service, which is outsourced to LiveChat. While representatives were able to answer some questions and help us access streaming sites, we got poor responses in other areas. For example, a live chat rep told us the VPN would work in China (which turned out to be inaccurate) and wasn’t able to answer some fairly basic questions about security. A better option for more specific questions is to use the contact form, which will connect you via email to an in-house representative. We got a professional and knowledgeable response within about six hours of submitting a request, which isn’t bad for email support. 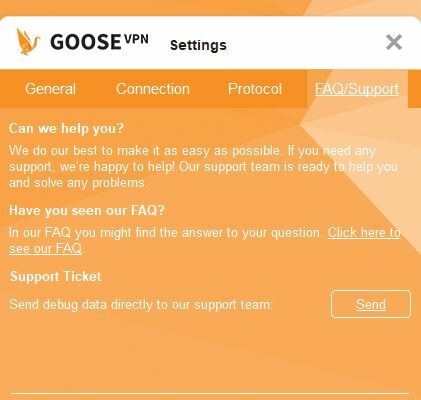 GOOSE VPN seems to be fairly active on Facebook and Twitter so these might be alternative options for getting in touch. 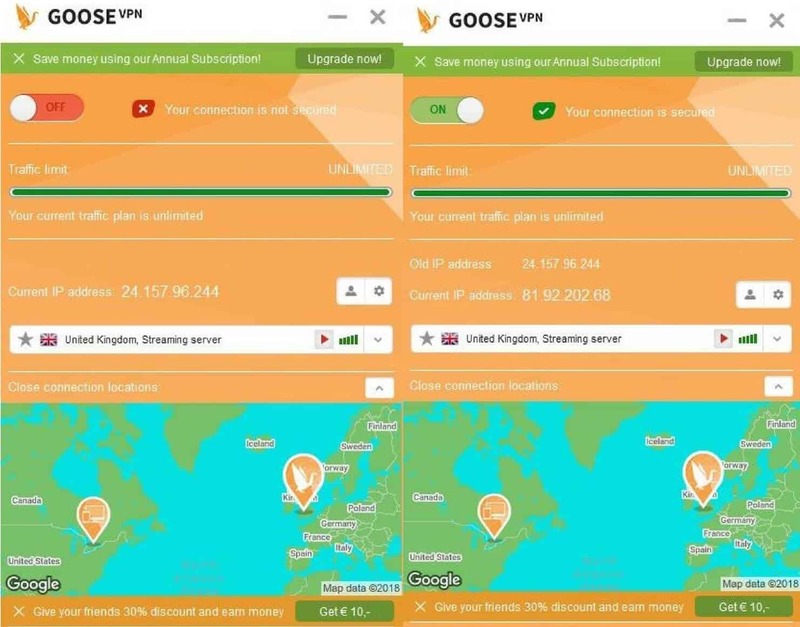 GOOSE VPN offers a reliable service for unblocking geo-restricted content, and unlimited bandwidth means it’s especially suitable for torrenting. The small server network may be an issue for some, especially those trying to unblock content outside of Europe or North America. Use on unlimited devices is a big bonus, but the desktop app could use an updated look. GOOSE VPN offers strong encryption and a kill switch (in the desktop clients) but is let down a little on the security front by the lack of IPv6 and DNS leak protection.